"As far as I can see it, this is unshakable evidence." 12 Angry Men follows the deliberations of twelve jurors, sweating in a stifling jury room one summer afternoon as they attempt to determine the guilt or innocence of an 18-year-old man accused of stabbing his father to death. At the outset, eleven men believe in his guilt, with Juror #8 (Henry Fonda) standing alone in reasonable doubt. The drama develops as the facts, eyewitness testimony and evidence are revisited and discussed; questions are raised, and votes change as prejudices, false certainties, and human errors are revealed. I often think of 12 Angry Men as one of the first "modern" movies. By 1957, Lee Strasberg's "method" approach to acting had found many adherents, and the film benefits visibly from the stage revolution then finding its way into Hollywood. Reginald Rose's naturalistic dialogue is ably handled by a stellar cast including Fonda, Lee J. Cobb, Jack Warden, Ed Begley, E.G. Marshall, Martin Balsam, Jack Klugman, John Fiedler. Every line sounds genuine, complete with throat-clearing and word stumbles, and the ensemble dynamics are flawless in timing and execution, no mean feat when dealing with twelve major characters who rarely leave the jury room. The characters are typed but not stereotyped, and all are credible human beings in difficult but thoroughly realistic circumstances. Former television director Sidney Lumet made his feature debut here, and his intimate camerawork effectively communicates the claustrophobia, heat and intensity of the debate at hand. He opens with a brief courtroom scene in which a noncommittal judge casually gives the jury the standard instructions in a bored monotone, a nice choice that raises the stakes for the following deliberations. When the action gets underway, he knows when to let his actors simply act, segueing into quick-cut editing and dramatic camera angles when the moment calls for a more visual approach. Lumet succeeds in creating visual variety and action on a one-room set, without becoming gimmicky or losing the emotional immediacy of the rapid-fire dialogue. I don't want to give away any plot details, and I'm running out of superlatives here, so I'll stop. 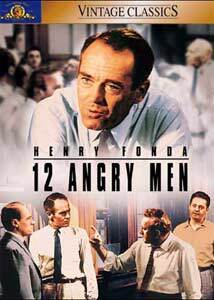 If you've never seen 12 Angry Men or have acquaintances who don't believe a black-and-white film sans foul language from 1957 can be intense, check this one out. A masterpiece in every sense of the word. Image Transfer Review: MGM presents 12 Angry Men in its original 1.66:1 widescreen theatrical aspect ratio, letterboxed within a 4:3 nonanamorphic frame. The vintage black-and-white photography looks just great on DVD, taken from a very clean source print (just a few flecks here and there) and digitally mastered with a crisp image and excellent shadow detail. The film's subtle grain produces no distracting digital artifacts, and Lumet's careful compositions are more striking than ever before on home video. I could nitpick about MGM's choice of 4:3 letterboxing over anamorphic windowboxing, but that would only be because I can find nothing else to complain about. Excellent work here. Audio Transfer Review: 12 Angry Men features its original English monophonic audio, in Dolby Digital 2.0 for ProLogic decoding to the center speaker, as well as a French dub. The English dialogue was recorded live on-set throughout, leading to quite a bit of hiss, crackle and echo to modern ears, and a few lines are muddied when actors speak from the "back of the room." The studio-dubbed French track is significantly clearer, with well-cast voices but middling lip-synch. Hardly a reference-quality track in either case, but the immediacy and power of the original performances comes through in spite of the dated audio. Extras Review: Unfortunately, the 12 Angry Men DVD features no substantial supplements, just 16 picture-menu chapter stops, French and Spanish subtitles, and the original theatrical trailer in 1.33:1 full-frame. The trailer is quite entertaining in its own right, though, as it strives to oversell the film's subtle tension exploitation-style. The narrator solemnly advises us to pray we ourselves might avoid the horrors of jury duty, where "twelve men with the smell of violent death in their nostrils" are "turned into twelve clawing animals!" 12 Angry Men remains one of the best American ensemble dramas ever written and committed to film, with a fine DVD transfer from MGM. Highly recommended.